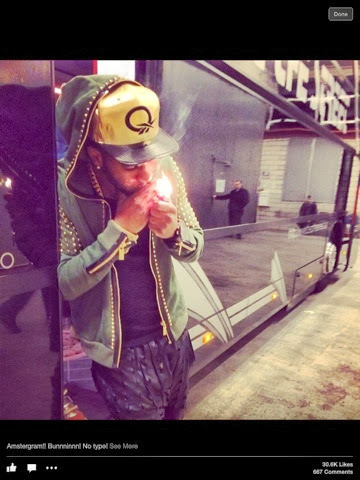 Jason Derulo drug scandal - flying high in Amsterdam? Noooooo Jason Derulo. Why why why? Just when you had me thinking you were an absolutely superb singer, dancer, artist & a shining example to the youth of today when it comes to juggling a successful career/ the fame & everything that comes with it, without turning into a Lindsay Lohan/ Chris Brown type (scandals, scandals, scandals), you go and post a picture of you seemingly doing drugs on Facebook. 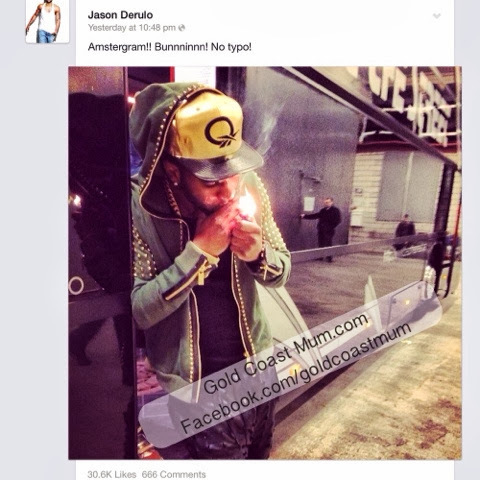 Accompanying Jason Derulo's photo was the comment: "Amstergram!! Bunnninnn! No typo!" The photo, shared on Facebook, had received more than 30,000 likes when I saw it. Some comments from fans cheered Jason Derulo on, others expressed their disappointment. What happens in Amsterdam is meant to stay in Amsterdam. Was it really necessary to share a photo of you holding something with a flame, insinuating that it's drugs? What kind of message is this sending to your younger fans (or fans of any age really)?! Nooooo, I'm so disappointed right now. I thought you were different. With your romantic lyrics & obvious love of girlfriend Jordin Sparks, here I was thinking you were this sensitive new age kind of guy (10,000 red roses for Valentine's Day, what a sweetie) & a perfect role model for the youth of today.